And almost two decades in, I still don’t have a clear answer beyond ‘I just do’. About 14 years ago I set up UKGospel.com, dedicated to supporting the amazing job that an incredible amount of people continue to deliver in this vibrant industry. In addition to UKGospel.com, there’s the UKGospel.com blog (a completely separate entity), as well as the UKGospel social feeds (of which there are a fair few, but I’m most often on the platforms du jour Twitter and/or Facebook). Like so many people with a highly specialist passion, I do it outside of – but in addition to – the day job. And there’s also UKGospel.com‘s audio output in the mix (primarily podcasts), with the attendant recording and production challenges that entails. Much of that is currently hosted on SoundCloud (and more recently, MixCloud). And also ticking away in the background, I have UKGShop.com to maintain, supporting UKGospel artists by stocking 100% UK Gospel music. 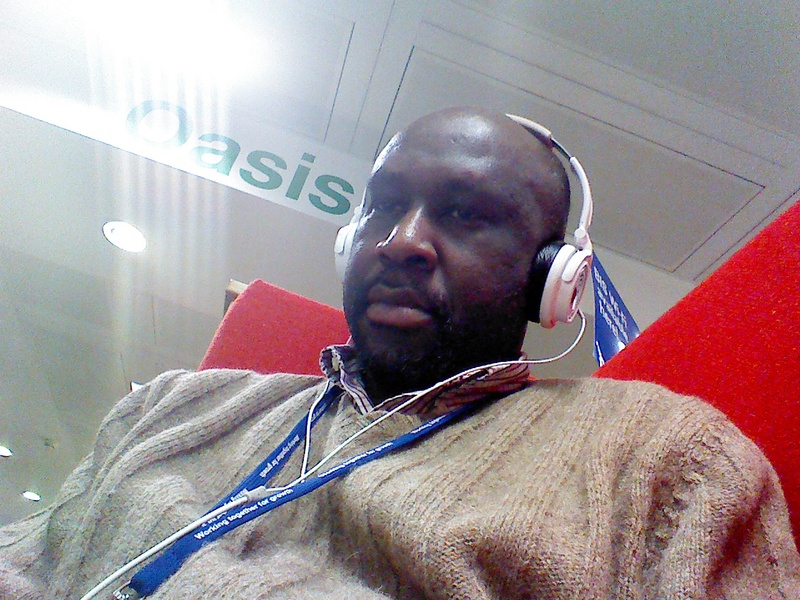 About 4 years ago I somehow fell into radio and currently present the breakfast show on London-based Premier Gospel, which, via London DAB radio, apps and the internet, is arguably one of the strongest digital Gospel music radio brands in the country. The production demands of doing live radio are enormous, but despite this I feel incredibly privileged to be at the epicentre of an amazing, warm and huge family all starting their weekday mornings from 7:00am with Premier Gospel. So, all that brings me back to the question: how do I do it…? I’d always thought it’d be fun to try mapping out my day in some kind of blog or diary form – a totally unoriginal idea I’ve had for years – which is one of the reasons I was never in a huge rush to do it. From a tech standpoint I’m fairly agnostic. But I’m also quite price sensitive, which means that as brilliant as Apple hardware and software is, its premium pricing has made me more of an Android fan. For the same reason I also don’t own high-end Android brands like Samsung or HTC flagship phones, and am perfectly content with my current phone, the rather excellent Huawei Ascend P1. I’ve been doing this for so long my body and mind are usually rousing just before the alarm goes off. These days I can probably wake up without really needing it, but I’m way too paranoid to take the risk. I’m on a 3-alarm routine: 4:30, 4:55 and the final (if I’m still lying down), ‘get up NOW’ ringer at 5:00. Today is Wednesday. It’s mid February. And it’s the middle of winter. That means it’s dark outside. And cold. The first thing I do is switch off the alarm on the phone (I rarely use the ‘snooze’ function), and get up right away. My lovely, cozy and warm bed is infinitely more inviting than anywhere else indoors, talk less of outside, but it’s time to get up. No excuses. I’ll fire up the PC and, while the computer wakes up, I’ll go get my toothbrush. Time for some prep work. By the time I sit down at the PC, toothbrush in mouth, I’m usually wide awake, with the brain synapses firing on all cylinders. In the middle of winter the weather forecast is absolutely crucial to me. Because of my incredibly long day I need to check primarily for two things: minimum temperature and rain. Both determine what I’ll wear. It’s a weird thing to prepare for: I need enough layers for the early morning freeze but not too much for the middle of the day and journey back home. I either check the BBC website on the desktop or use its simple but really good weather app on the phone. 95% of all my work is done in Evernote. It’s easily the most important app in my life and I can’t recommend it highly enough. Using Evernote means I can make notes, record ideas (text and even audio), write features, upload pictures, plan projects and a whole lot more, while continuing to work seamlessly between my PC, phones and tablet. Top of my to-do list right now is my radio show ‘clock’ (essentially the listing of everything that happens during a radio show). I plan the music and structure for the day’s show, and if there are any special features, competitions or guests for that particular day, this is when things get fine-tuned. I might also spend a few minutes prioritising what UKGospel.com stories I’ll either continue editing, start writing or publish later that day. Right now though, priority is given over to show prep. I’ll finish prep work between 5:30 and 5:45, and get ready to shower and then leave. 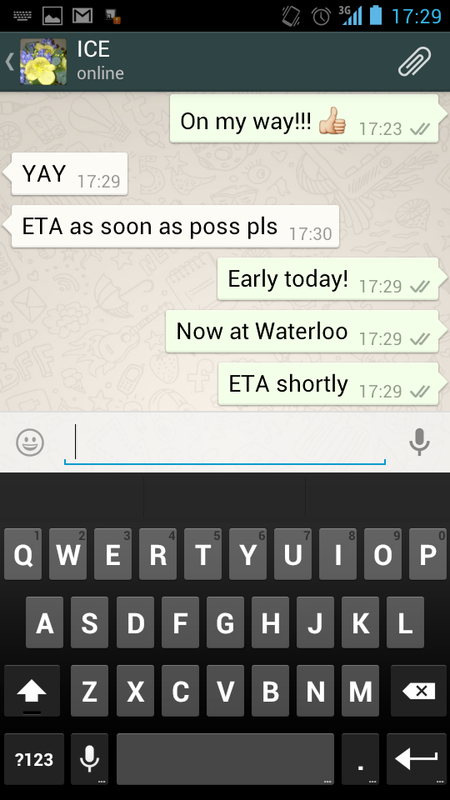 The train station is only a short distance away, and I need to get the 6:06 to Clapham Junction. There’s a 19-minute train journey to Clapham Junction, so I get down to some multi-tasking. Seeing as show prep was done at home, I use this time to focus on writing (Evernote), reading (Pocket), and listening to music (Google Play Music). on articles I’ve saved to Pocket (mostly marketing, tech news or faith-related stories). 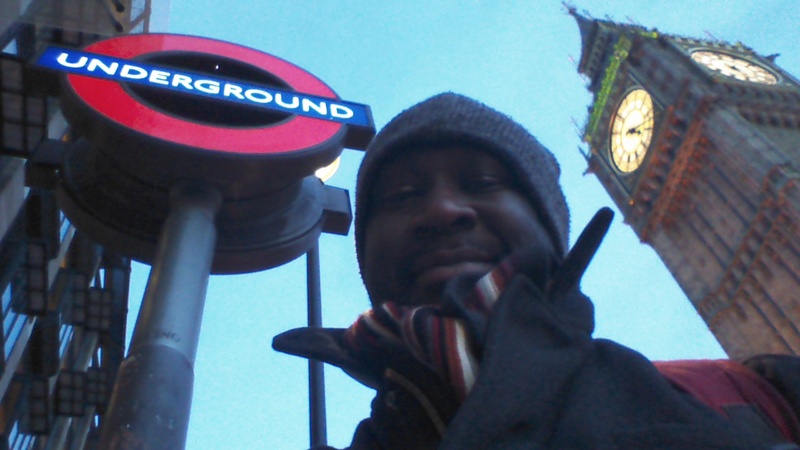 Right now the focus is all on a story I’m writing for UKGospel.com called ‘Hello 2014, Goodbye UKGospel.com…?‘, as I’m considering shutting down the site (in the end I decided to continue running it). I change at Clapham Junction for Vauxhall and wait for the short bus ride over Vauxhall Bridge to Premier Gospel studios. Depending on how early I am I sometimes just walk or take a ‘Boris bike’ over the bridge. 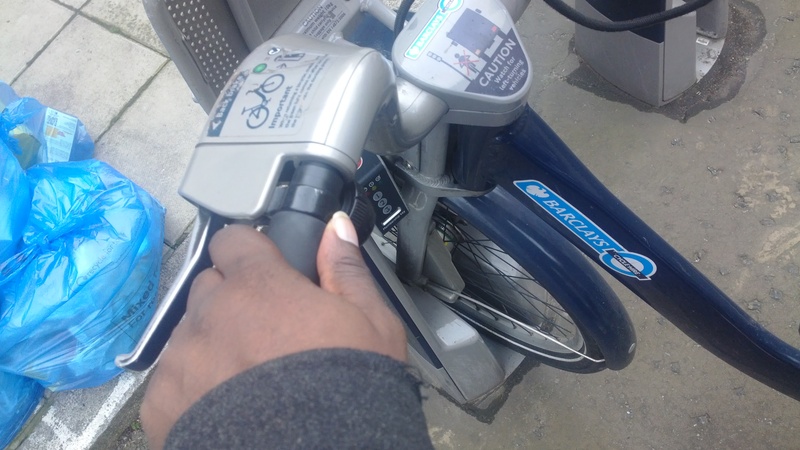 More on Boris bikes in a bit. Often I’ll bump into Premier Christian Radio legend (and very, very nice man) John Pantry who broadcasts at the same time as I do in the studio next door. A short prayer off air, and the show kicks off in earnest at 7:00 a.m. Two hours of great music, travel and weather updates, banter and the occasional giveaway. Audience participation is key to the Gospel Breakfast Show, and social media is an essential element of that. Much of the show is spontaneous, and a lot of what I say and do is highly influenced by listener interaction – so while the music is always brilliant, no two shows are quite the same, and I absolutely adore the spontaneity of the entire process. forecast in the Queen’s English in a Yoruba accent (you had to have been there). I was also hi-fiving myself in the studio as I was on my own (again, you had to have been there). 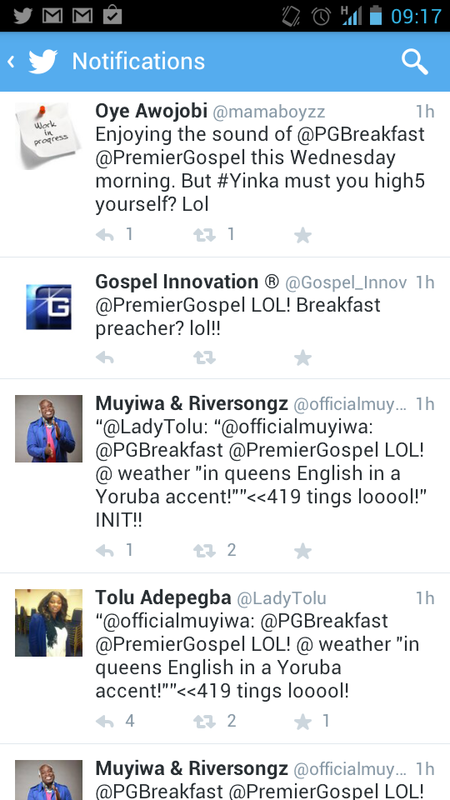 That sparked Twitter responses from fellow presenters Muyiwa and Lady T, as well as listeners Gospel Innovation and Mamaboyzz. Two hours goes by very quickly indeed most days, and regardless of how well, or – thankfully very rarely – how badly the show went, it’s time to get ready for the day job. By the time I get out, it’s fully bright. It’s only a 5-10 minute walk away but sometimes I’ll hop on a Boris bike and ride to work. I don’t get enough exercise so the Bike Hire Scheme is a Godsend. Time to stop by the local Tesco to pick up lunch. 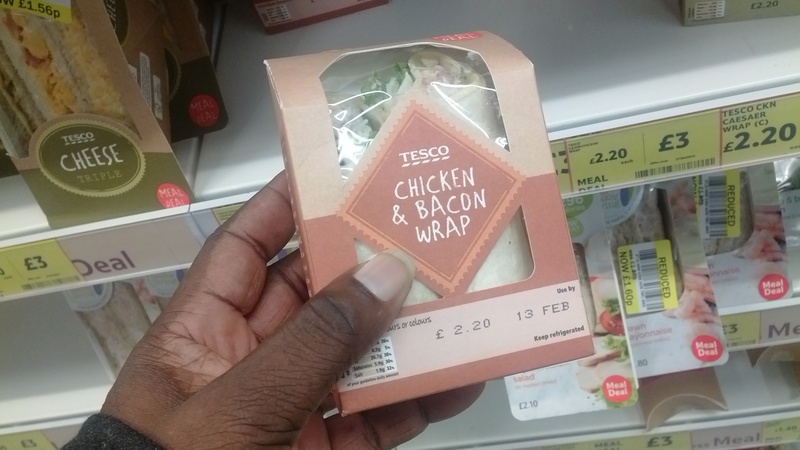 Today it’ll either be a wrap or a sandwich, more than likely chicken and bacon. I’m not very adventurous with my food, so once I find something I like I tend to stick with it. 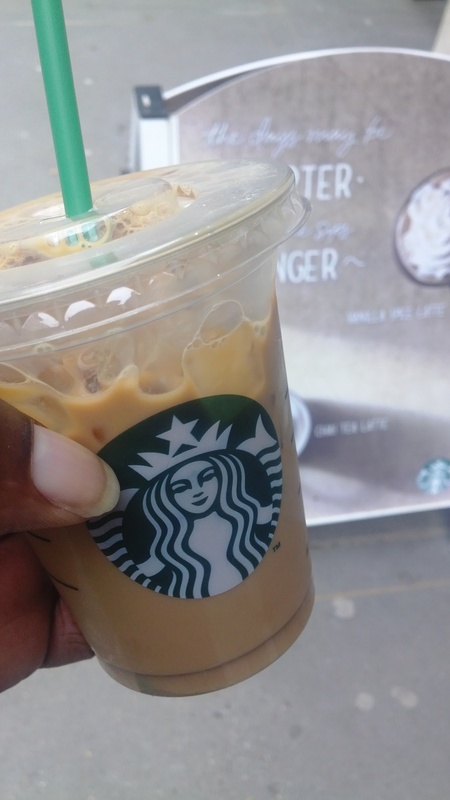 There’s a Starbucks round the corner from the office. I pick up my usual ice latte. Best meal of the day..? 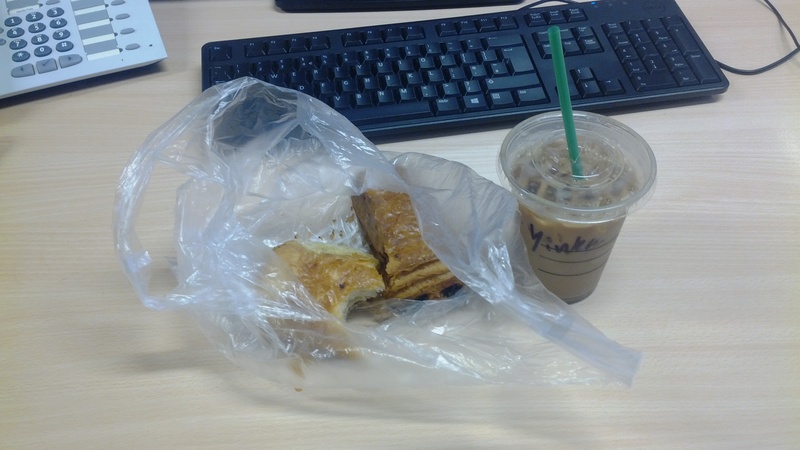 I’m usually not that hungry until I actually sit down at my desk to have my two croissants and ice latte. Then the hunger hits me. This will be the first time I actually eat in the day, and I generally don’t miss food before now. Ironically if I have anything before the show it messes up my food routine for the day, because I would probably still have my morning croissants and latte. Tech: Computer and/or mobile phone, more than likely tablet (currently Google Nexus 7). The day job is parked for about 40 minutes as I work on publishing of more content. This could be researching a story, continuing work on a draft, or publishing a piece. 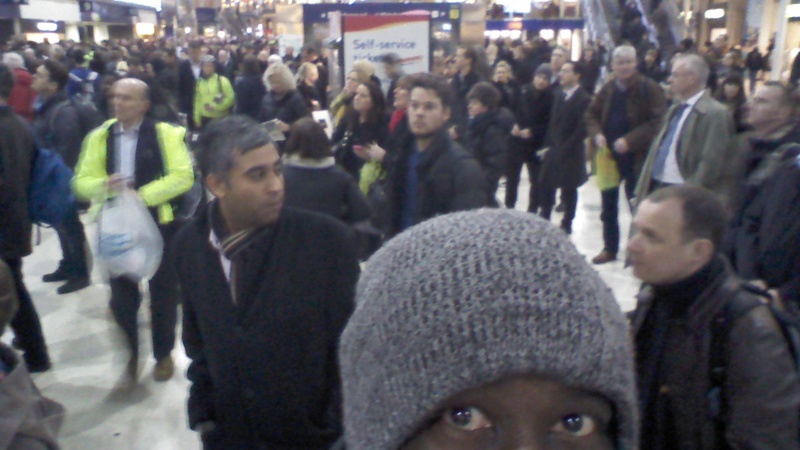 From work I have the option to walk, take a Boris Bike or a tube ride to Waterloo Station. Today it’s cold, so tube it is. The train ride to Waterloo is only a couple of minutes, so it’s time to catch up on some reading. I’ll do the reading either on the phone or tablet as it’s not enough time for me to get into the mindset to start writing or editing (I save all the articles and blogs I’m interested in following up in Pocket). For the 25 minute journey to my home station, my commute will fit firmly into two of three categories: feature editing and writing, listening to music (or a podcast), and reading. My second option on the commute will be reading via Pocket, as usually the train is too crowded for any serious writing or editing session. It’s relatively early for me to be going home (I usually leave work about an hour later than this) but I’m happy to be heading back. Time: coming up to 18:00 p.m.
I’ll pick one of literally up to 100 articles, features or blog posts I’ve saved in Pocket to read. Usually it’ll have to be something I’m keenly interested or passionate about, as most times I’ll be standing on a packed train, and getting increasingly tired. Because I’m usually not home this early I’m spoilt for choice as to what to do. Typically I’ll be very tired from my long day and ready for bed. Now I’m primed to do one of a few things: some reading with my youngest son (if he, or – more often than not – my wife) decides he wants to read his homework with me. I could also watch some TV (I’ve saved a huge batch of American science fiction, car shows and crime dramas on my Sky box, plus OTT reality TV shows – I’m *addicted* to Storage Hunters and Storage Wars at the moment). I’ll also check social media – that’s pretty much guaranteed – or pick up where I left off on some UKG content.